I had no team, no friends with such dreams nor any means of financing, I am from a middle class family and mountaineering is an expensive business. I couldn't shell out a hefty sum to climb a peak, stand on summit for 10 minutes and then get back down when I was a student. Still I practiced and prepared for weeks, hoping for a miracle before the climbing season began. And it happened. 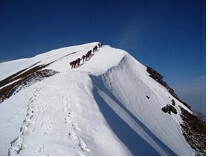 One fine day, I came to know about 'Life Away From Life' organizing expeditions to this peak and a day or two later, out of nowhere, about 'Life Unlimited'. LU is a group of guys who fund your dream, if they feel you will live your dream but it is out of reach coz of finances. So I applied to LU, got funded, applied to LAFL and got a place in the Stok Kangri expedition. I went for a trek to SarPass in Himachal, organized by YHAI as a preparatory trek and test for my fitness level in May 2008. After successfully completing it without much exhaustion and a month's rest, I headed towards Stok Kangri on the Manali-Leh road, sitting on bus conductor's lap as the bus was fully booked. It's a 2-day bus journey with a night halt at a sleepy little mountain town, Keylong. 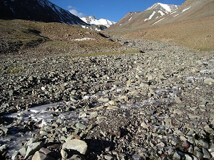 Going by Manali–Leh road helps acclimatizing as we gradually gain height and the route contains 3 high passes, one of them as high as 17500 ft, the 2nd highest road stretch in the world. 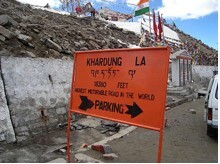 I reached Leh on the night of 16th June 2008. 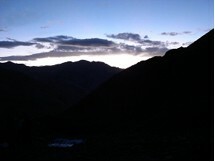 Rest of my team was to arrive by 19th, so I had 4 days to myself among the bare mountains of Ladakh. I walked the streets of Leh, went for sight seeing to Khardungla, the highest motorable road in the world, climbed hills around Leh, stood on their tops thinking about and admiring life, nature and everything. 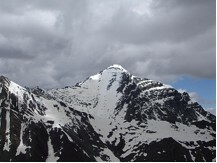 I saw Stok Kangri peak, prayed to mountain gods for good weather and for our team's safe and successful accent (as well as descent). The days passed quickly and soon my team arrived. Prateek introduced me to Pamposh, Disha, Nalin and Nishank. 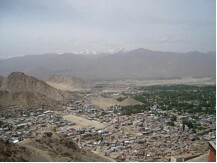 Even at Leh, a brisk 2 minute walk was enough to get me panting and gasping for breath. For once, I thought maybe I should back out, maybe I am not fit enough for this climb but my local friends there encouraged me to keep going. On 21st, we left for Spituk, an hour's drive from Leh. It was the starting point of our trek where we met our Sherpa leader, Palden and other support staff. 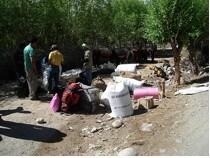 Our logistics were loaded onto horses and we set off for the trek along the banks of river Indus. After a 6 hour trek, we were at our first campsite, Zingchen. 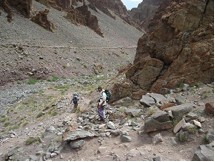 The route is motorable but we chose to trek to improve our acclimatization. We spent the evening playing football at the campsite and climbing a small nearby hill, watching clouds, moods of sky during sunset, stars and lots n lots of spy satellites in the dark. The next day we had planned to camp at the village of Rumbak but on reaching there we decided to camp an hour ahead, at the base of Stokla to make next day less taxing. All of us were damn exhausted by the time we reached our campsite. The time lag between the first person reaching campsite and last one was around an hour. 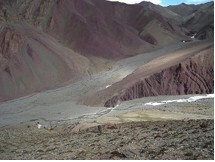 To add to misery, our campsite, being on the base of a 5000m pass, was extremely cold and windy. Next day, we left early in the morning to climb 3000 ft to the top of pass and get down on other side and walk to our next campsite, Manokarmo. This was another long day with the time lag between first and last person to reach camp being more than 2 hours. At this camp Prateek, Nalin, Nishank were to part with us and head back to Leh. The 3 of us: Disha, Pamposh, me along with our sherpa leader, Palden, cookji and ghodewala started the trek to base camp next morning. We experienced mild intermittent snowfall on the way. Reaching base camp much behind our schedule, we analyzed the snow conditions there. We came to know that only 2-3 teams have summitted so far this season and most teams couldn't make it to summit. 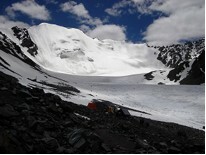 Weather was perfect but there was a lot of snow above advanced base camp (ABC). We had one day scheduled for acclimatization at BC itself but we decided to camp ahead at ABC. It was a little over couple of hours above but it'll significantly increase our chances of summit. The ridge was a desolate place, a meter wide surface of uneven and loosely held rock and snow and steep slopes on both sides. 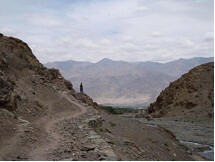 We could see peaks belonging to Pakistan and Tibet from the ridge. The thinness of air was getting into us and no amount of deep breathing or rest was renewing strength. I just told myself '5 more steps' and kept going and going. We kept walking till 5:30 in the morning, stopping no more than a minute at every break as we got cold waiting. For all past week5 nights that we slept badly coz of altitude, at this higher altitude we fell asleep as soon as we stopped to rest. At times it was so bad that I literally went to sleep roped to Palden and Pamposh. A tug in the rope woke me and we kept going like donkeys do in a line. 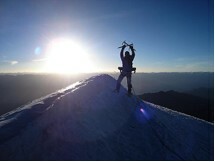 When it was 10 steps to summit, I saw the summit, emptily, nothing getting into my head, where am I, what am I doing. I took a step ahead and stopped for 4 breaths, another step, again stop for 4 breaths. They were the longest 5 meters of my life. On reaching summit, I leaned on my ice-axe and went to sleep; Pamposh fell down on his knees and tried to breathe air, which did not exist. We hugged each other. My tears froze to cheeks. 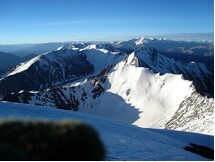 We took photographs and admired the beauty of the highest mountains of the world. We could see K2, the most difficult and 2nd highest mountain of the world. It felt so close; I felt if I stretched my hand, my fingers will touch it. I left a paper with names of all in my family (I wanted to place my family picture there but couldn’t arrange for it) and prepared for descent. Getting down was worse than ascent because of my lack of experience in walking with crampons. I fell down once and slipped on a snow slope for a little distance. Pamposh fell once too but managed to arrest his fall quickly. It was getting extremely hot as sun was up and the pain in knees coz of heavy double shoes used in mountaineering was too much to take in for me. After halfway down, I was almost dead. Palden and Pamposh urged me to move on. And I sat down, refusing to take another step. I asked them to unrope me and move on. After slight persuasion, they agreed and hurried down the slope. I saw them, bewildered and I started descending slowly, very slowly. At places, I slided down patches of slope, althouh Palden had asked me not to, under any circumstances. I realized why I shouldn't on one particular long slide. My crampons got stuck in the snow when I was speeding and I tumbled over. I kept tumbling over and over, gaining speed, every now and then, my crampons would again get stuck in the snow and make it more painful and worse for me. Palden and Pamposh were out of view, and other teams were still way too high. After some 15-20 seconds of skidding, I halted as the slope gradually eased. My back was badly hurting coz of the rocks, which came on my way when I was skidding. Dragging my body further down, I somehow reached our high camp at the edge of the glacier. The interconnected network of streams, small glacial lakes and crevasses, which were in the dark last night, all came into view. It was awesome. When I reached our high camp, the tents were gone and Palden was sitting there. He told me that we are going further down to base camp. I died once again. We started to walk but within 2 minutes, he was walking quite ahead of me. I was alone once again among the mountains. At 9:30AM, I turned around a corner, from where it was 5 minutes to base camp. I saw our camp, and Disha sitting out on a mattress, combing her hair. Girls can never not be doing something about their beauty, not even at 17000ft. I reached camp, fell down. After 2 minutes, I realized, I had done it. 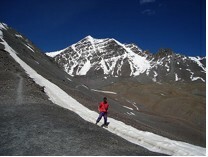 I had climbed Stok Kangri. I hugged Disha, I ran to Palden, who was busy in kitchen tent, eating tuna. I hugged him and thanked him for helping us throughout. I looked around for Pamposh but he was fast asleep in his tent. That day we had a cake for lunch. It was a time for celebrations. That day base camp was a colorful place; there were all sorts of emotion and people. There were trekkers from across the globe. 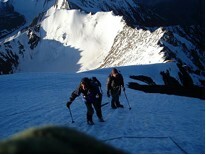 Anxious ones, who were going to attempt the summit that night, trekkers with fulfilled dreams, who summited last night. 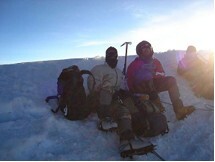 Those who couldn't summit were either disappointed or were enthusiastically planning another attempt on the peak. 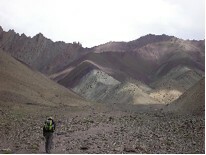 The next day we trekked further down to Stok Village, from where it was an hour drive to Leh. Once back in civilization, I called my family and told them I had done it and I was safe. 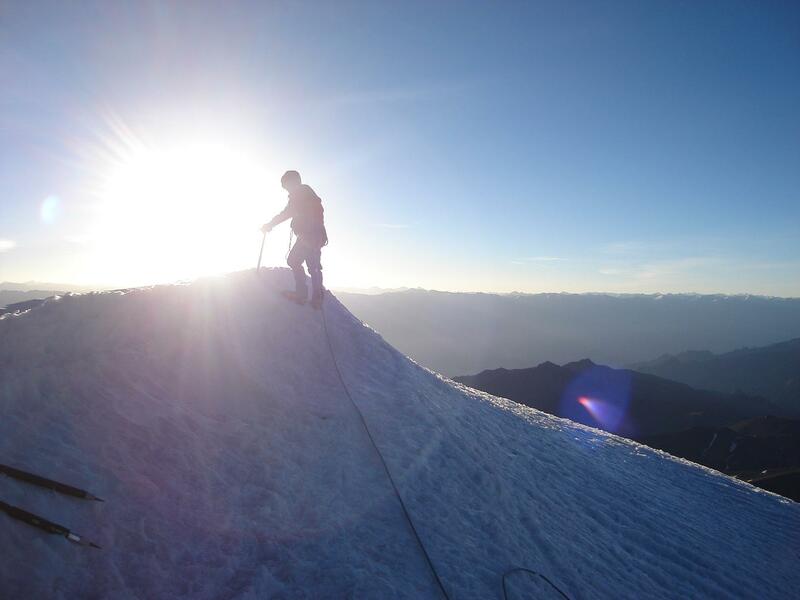 My friends often ask me, why trek, why climb? What do you get by spending so much money on nothing at all? Why give pain to yourself for no reason. Trekking makes you aware of little pleasures of life, which are taken for granted: warm water from tap, a comfortable bed, choice of food. You realize value of these things when you miss them. And you need to feel the mountains, the freshness in the air, the cool of the streams, the sound of birds, water and the sound of silence. Just look at the rugged terrain of the vertical world, its dangerously beautiful and the patterns of snow, ice, rocks and glaciers. The calmness and peace that persists above 10, 000 ft is unmatched in the world. Mountains make you aware of your insignificance in this whole big world, and when you climb it, they show you presence of something within yourself, some power which can't be described in words; of being so high that the mountain let you climb to its peak, of achieving something, which made the mountain took off its veil to reveal the immense and serene beauty they posses. Being on a peak, on top of world, it gives feeling of a lifetime. Because I believe that it’s the mountain who decides whether you can climb or not. The mountains hold great strength. So respect the mountains, they can kill you in a heartbeat. It’s worth it, the risk, to be for a single moment above the clouds, to touch God's soul.